Comet 203648A - 3-Pack of "Standard" Heavy Roller Weight Kit for 40 Series Comet Industries Drive Clutch. Comet Industries 203648-A. Home > COMET INDUSTRIES BELTS > COMET 203789 (A or DF). COMET INDUSTRIES BELT 40-110 > COMET 203015A. Model 40C Drive Clutch > Comet 204529C. Comet Industries 40 Series Drive Clutch. > Comet 203648A - 3-Pack of "Standard" Heavy Roller Weight Kit. Comet 203648A - 3-Pack of "Standard" Heavy Roller Weight Kit for 40 Series. Comet 203648A - 3-Pack of "Standard" Heavy Roller Weight Kit. 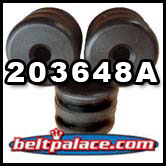 Comet "Heavy" roller weight kit 203648A. Comet Drive Mod kit 203648-A. For use with Comet 40 Series Centrifugal Clutch drive systems. Genuine Comet 203648A Roller Weight Kit (Heavy) for Stock Engagement of 1600 RPM with Comet Industries Yellow Spring Kit 203043A. Made in USA by Comet Industries. COMET 203015A DRIVE CLUTCH. Model 40C Drive Clutch, 1" Bore, 1/4" keyway.Genuine COMET INDUSTRIES part made in USA. Replaces: GKS G4000, Kenbar 400-001, Comet 203015. 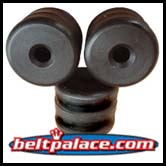 Used with Brister, Ken-Bar, Carter, Manco & Kartco karts. Replaces: GKS G4000, GTC TC40 DRIVER, Kenbar 400-001, MANCO (ASM) 2594, Comet 203015. Comet 204529C. Comet Industries 40 Series Drive Clutch. Comet 204529C. Comet Industries 40 Series Drive Clutch. 1" Bore. Comet/American Sportworks-ASW/MANCO Part 204529-C.